You are currently browsing the archives for the Michelle Benson category. This AP article all-but-officially says that U.S. Senate Minority Leader Chuck Schumer will pick Al Franken’s replacement. If Gov. Dayton’s pick is approved by Sen. Schumer, then it’s a safe bet that candidate will be Sen. Schumer’s shill for the duration of their Senate career. Suddenly, Lt. Gov. Smith is interested in running for re-election if appointed. It essentially cuts Minnesotans out of the process. Shouldn’t Minnesotans, not a partisan New Yorker, pick Sen. Franken’s replacement? The people should have a say. Franken’s replacement shouldn’t be picked by Minnesota’s royal family, then rubberstamped by the people. Picking Lt. Gov. Flint-Smith, or anyone that will run for re-election, hints that we’re just rubberstamps. Joe Davis, the executive director of the DFL-aligned Alliance for a Better Minnesota, said a second Senate race will further nationalize the Minnesota election, which can only help the DFL chain Republican candidates to a historically unpopular president. “It’s a chance to put not just one but two checks on Trump’s Washington,” Davis said, referring to the special election as well as DFL Sen. Amy Klobuchar’s re-election. DFLers hope that anti-Trump fervor will trickle down the ballot to the governor’s race and legislative contests. State Sen. Karin Housley, R-St. Mary’s Point, said she is mulling the race and will make a decision early this week. Sen. Julie Rosen, R-Vernon Center, said she remains focused on a potential run for governor and has no interest in the U.S. Senate. State Sen. Michelle Benson, R-Ham Lake, said she is talking it over with family this weekend. This isn’t a statement of preference. It’s just a statement that Karin Housley would be a fantastic candidate. She’s a skilled legislator. It doesn’t hurt that she’s married to NHL Hall of Famer Phil Housley. Her fundraising ability would be a positive, too. Michelle Benson would be an attractive candidate, too. She knows health care inside and out. She’s a reliable conservative, as is Sen. Housley. Americans don’t just want members of Congress to be decent people, they also want them to actually do things that benefit them, their communities, and the country; what they don’t want is someone who solely uses their elected offices as a springboard to more power (it was the worst kept secret in Democratic circles that Franken was considering a run for president in 2020). Parting question: is Tina Flint-Smith another reliable vote and political nobody? I remember when Minnesota’s senators were difference-makers. First, Republicans have agreed that there needs to be a rebate system for this year to help people who don’t qualify for the federal subsidies. That’s the entirety of Gov. Dayton’s plan. Gov. 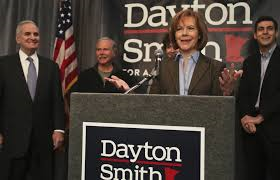 Dayton’s plan doesn’t do anything to fix anything for the long-term. If that isn’t fixed, Minnesotans will be faced with a bigger crisis this time next year. This isn’t a matter of Republicans “dilly-dallying around.” It’s a matter of whether Gov. Dayton will stop pretending the ACA is a solid health care system. It isn’t. Q: How much can the Legislature really do before the changes from the federal level become clear? A: We have to put some solid things in place. I think we have to look at a reinsurance program (to help insurers pay for high-cost patients). How do we improve choice of competitiveness? I don’t know if we’ve already gone too far. Can the individual market recover? Thanks to Minnesota’s reinsurance program, Minnesotans with pre-existing conditions could get health insurance at a reasonable price. It isn’t coincidental that health insurance premiums have skyrocketed since it was eliminated. The Minnesota Department of Human Services sent 3,000 letters to homes of MinnesotaCare recipients who may have received incorrect monthly billing statements after they applied for health coverage through MNsure, the state’s new health care exchange. The letter tells those recipients the bills may have been wrong for several months, but they encouraged those clients to keep paying the bills anyway. It’s ironic (and infuriating) that the Department of Human Services quickly sent out letters to MinnesotaCare applicant to keep paying their insurance premiums but they’re still working on sending out the letters to people who applied for MinnesotaCare but didn’t submit all of the paperwork that’s required for application approval. Put a little differently, Dayton’s Department of Human Services wants its money ASAP but it isn’t that interested in getting MinnesotaCare applicants insured. That’s a terrible priority to set. State Sen. Michelle Benson, (R) Ham Lake, sits on the MNsure Legislative Oversight Committee. She says the MNsure vendors still play a role in this problem even though the billing is handled by DHS. “If a private company told its clients to keep paying monthly health insurance premiums even if they might be incorrect, the Minnesota Department of Commerce would come in and clean house,” Benson said. In addition to the Department of Commerce getting involved, it isn’t a stretch to think that Lori Swanson, Minnesota’s Attorney General, might start an investigation if a private company did this. MNsure representatives did not want to do an on-camera interview with us because DHS handles all of its billing practices. It isn’t surprising that the Dayton administration didn’t want to answer KSTP’s questions. They’re probably thinking that the last thing they want is to subject themselves to tough questions about a difficult situation. With MNsure certain to not work again when this year’s open enrollment period begins and with the Dayton administration’s incompetence still manifesting itself, it’s a matter of whether Minnesotans will accept this level of incompetence. If they don’t, this won’t be a good year for Democrats. Most of those enrolled through the exchange are on public subsidies. As of last week, nearly a quarter-million Minnesotans had enrolled. Of those, 88 percent, 218,615 out of a total of 249,369, are receiving a public subsidy. That leaves 30,754 Minnesotans who purchased a plan on their own via MNsure. The system is preparing to absorb still more public enrollees. MNsure has delayed until August a major transition of public insurance beneficiaries to the system. About 800,000 Minnesotans will be renewing their current coverage. MNsure CEO Scott Leitz told the editorial board earlier this month that the agency “wanted the system to be stable” to handle the influx. During the assessment, 47 of the 73 sub-functions addressed were found either to be absent or not functioning as expected. Six of the 73 sub-functions could be considered for implementation post-open enrollment. The remaining 41 sub-functions need to be provided for the 2015 Open Enrollment either through changes/enhancements to the systems or through contingent means. That’s what instability sounds like. Last fall, MNsure’s rollout was a disaster. This year’s open enrollment will be a bigger disaster than last year’s open enrollment. Thanks in part to that, the revenue shortfall will be greater this year than last year. With MNsure stability being at least a year away, it’s likely that the shortfall for the next biennium will be huge. It’s difficult to see this turning out well for Minnesota taxpayers. In the end, though, these shortfalls will put pressure on the DFL Senate to resist changing MNsure. It’s time for the DFL to accept the reality that it’s time to start over on health care reform. When a system is this disfunctional, this expensive and this unpopular, it’s time to start from scratch. Minnesota was a leader in health care. We should’ve learned from that. Instead, Gov. Dayton and the DFL legislature created this financial nightmare. A key point, however, noted by the Pioneer Press’ Christopher Snowbeck: The report couldn’t say exactly where the uninsured found coverage, that is, whether insurance was obtained through public programs, private insurers available through MNsure or commercial plans sold outside the health exchange. That’s spot on. Rather than weighing the options, Gov. Dayton, Sen. Bakk and Rep. Thissen let their ideology drive their votes. As a result, all Minnesotans will be hurt financially. Let’s be clear about this. There aren’t enough rich people in Minnesota to raise taxes on…again. The DFL will have to raise taxes on the middle class if these MNsure deficits continue as expected.